On the heels of her most critically acclaimed album of her career, “Me. I am Mariah… The Elusive Chanteuse,” best-selling female artist of all time Mariah Carey embarks on a world tour entitled “The Elusive Chanteuse Show.” This will be Mariah’s first reemergence to the stage since her celebrated and extensive “The Adventures of Mimi” tour in 2006. The Elusive Chanteuse Show will launch with two dates in Japan, a favorite stop for Carey, where she holds the title of the best selling international artist with over 20 million albums sold. Mariah’s ‘Chanteuse’ will play 12 exclusive dates in Asia starting October 4, 2014, including the superstar’s first ever visit to mainland China. 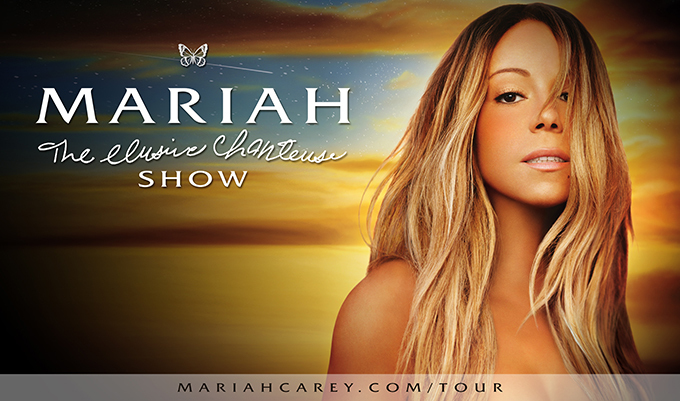 Visit mariahcarey.com/tour for up-to-date information as the shows get announced. Carey’s set list will be an exciting mix of her biggest hits, fan-favorite album cuts, never-before-performed selections from her #1 R&B Album “Me. I am Mariah… The Elusive Chanteuse” and many more surprises! With her distinct five-octave vocal range, prolific songwriting, and producing talent, Mariah has defined the modern pop performance. As a singer/ songwriter/ producer, she has been recognized with multiple Grammy Awards, 21 American Music Awards, Billboard's “Artist of the Decade” Award, the World Music Award for “World's Best Selling Female Artist of the Millennium,” and BMI's “Icon Award” for her outstanding achievements in songwriting, to name a few. Mariah Carey's ongoing impact transcends the music industry to leave an indelible imprint upon the world at large. She has made substantial marks in film with critically acclaimed roles in Precious (2009) and also in Lee Daniel’s The Butler (2013). A Congressional Award recipient, Mariah has generously donated her time and energy to a range of philanthropic causes near to her heart including Save the Music, the Make-A-Wish Foundation, World Hunger Relief, and the Elton John AIDS Foundation, among many others. A tremendous supporter of children’s charities, both domestic and international, Mariah founded Camp Mariah in partnership with the Fresh Air Fund, a retreat for inner city children to explore career development. Stay up to date with tour announcements at www.mariahcarey.com/tour and follow Mariah on Facebook and Twitter at @MariahCarey. Dear Mariah, please come to Russia! Can't wait to see you here!!! I'm wondering if there'll be tours in Europe this year? I'm so eager to listen to your concert! Hey Mariah, I really hope that you will be so kind to bring your show to South Africa where over 240 000 SALambs await !! I'm ready for your concert here in the Philippines dahhhlin'.